That’s right! Respected vape reviewer, Vapin Heathen, paired up with HellVape to bring you the stylish, high-functioning, Dead Rabbit RDA! This creative design features an elevated post-less quad terminal build deck with diagonal dual slotted top-side airflow to ensure optimal flavor, minimal leaking and cooling to the internal chamber. It has gold plated positive posts and a gold plated 510 pin. It is capable of running both single and dual coil options. This RDA has a seriously spacious building/wicking area AND deep juice well, as well as a squonk ready bottom feeding 510 pin! The deck is connected with a PEEK insulated block for a heat resistant foundation. But wait, there’s more! ? This RDA comes with a 10mm wide bore 810 Resin Drip Tip, 10mm wide bore 810 Delrin drip tip, and a 510 drip tip adapter. If you’ve been looking for an RDA that has it all, come get yours today! 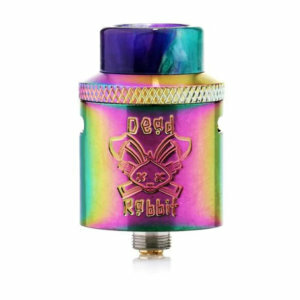 To purchase your own Dead Rabbit RDA, CLICK HERE!